Sixth plate tintype in a half case showing a Union cavalry soldier with sword, hardee hat and massive Starr Double Action Revolver. The plate has some issues with flaking under the mat and bending across the center of the image. It is one shade dark too. Overall a great image with a perfect shot of that revolver for a decent price based on condition issues. The item "Civil war tintype of Union cavalry soldier double armed with starr double action" is in sale since Tuesday, March 12, 2019. 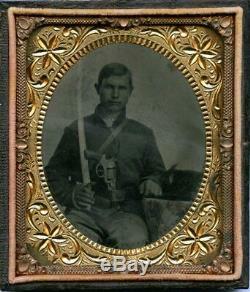 This item is in the category "Collectibles\Militaria\Civil War (1861-65)\Original Period Items\Photographs". The seller is "bbvd" and is located in Torrington, Wyoming.